For my recent birthday, my wife and I went to Eugene, OR to sample some of the city's breweries, specifically Ninkasi Brewery and Steelhead Brewery. To safe some dough, we brought our own lunch. After sampling some beer, we decided to simply eat where we were. No picnic benches ... no problem. 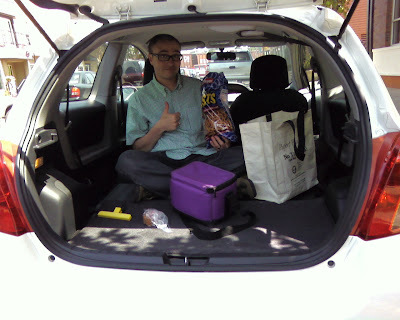 Just fold the Yaris' rear seats down flat, fold over the little panels that cover the gap, and eat. Not too bad! Now, I don't know if I'd want to sleep back there, but for a quick lunch that's out of the shade, the Yaris makes a pretty good picnic spot. And hey—who doesn't like pretzels? You must have the split rear seats (bundled with power windows iirc), mine's the one-piece so I scratched my head for a second about the "little flaps". You're correct—I have the split rear seats.